My interest in cooking began the summer before I started grad school...in other words, I realized I would be moving out of my parents' house and had better start learning to cook for myself unless I wanted to eat frozen dinners for the duration of my graduate program! And so began my growing fascination with reading cookbooks and scouring the internet for recipes. I started with cookies, and as I became more competent in the baked goods department, I expanded into real food. My own tastes have developed in the process too...I now try to make healthy treats and meals for myself as often as I can, and although I have always considered myself a flexitarian, in January 2011 I decided to become fully vegetarian. It's been going great so far...not only do I love discovering creative new ways to incorporate more vegetables and natural ingredients into my diet, but I also feel a lot better after eating them! And while I am not vegan at this point, I have been eating less dairy and a lot of my cooking and baking is vegan (as you can see in the Recipe Index). My inspiration for cooking comes from a few different sources, including food that I've experienced while travelling in other countries; produce that's in season and what's available at farmers' markets; and from the many wonderful food blogs that I read and the blogging friends that I've made along the way. 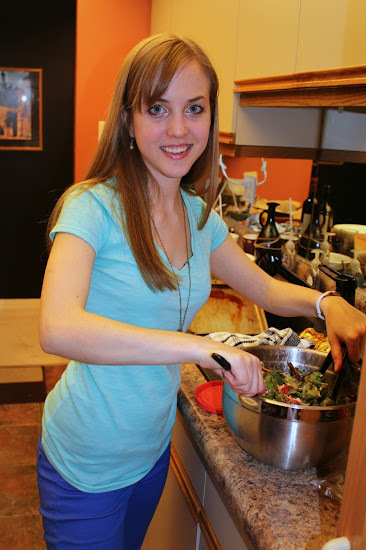 I also have a twin sister who has her own food blog - check it out at Once Upon a Cutting Board. I agree with everything on your favourites/dislikes list except for pineapple and carrot - like them but not sure they'd make my list. And you're missing the ingredient that makes everything (well except baked goods) better - CHEEEESE! Hey, I am happy to see my dear in kitchen.. I know you liked it so much.. and i like to see you cooking for me.. :) :) .. selfish me!!! Hey there...ever thought of taking cooking up as your career? Sounds like you'll do awesome at it.